HERITAGE ANTIQUES, doing business for most of the last 30 years as a landmark at the corner of Kailua Road and Hamakua Drive, will be moving out to make way for a new tenant of the area's landlord, Kaneohe Ranch Co.
A protest petition against the shop's impending closure and other changes in Kailua, drafted by a Heritage Antiques customer, is picking up steam and bears hundreds of signatures, said the shop's owner and President Martha Phillips. 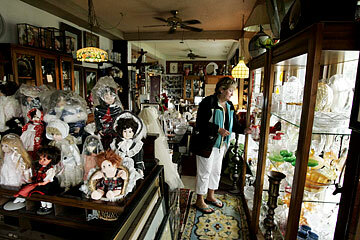 The antique shop is famous, according to Frommer's travel guides, for its Tiffany-style lamps. Phillips said the shop also has been on a month-to-month lease since about 1999 with Kaneohe Ranch, the major landowner in Kailua. Kimo Steinwascher, vice president of leasing and development for Kaneohe Ranch, called the issues involving Heritage Antiques' lease "sensitive." "We've tried to work with this tenant, but it just didn't work out," he said. Not long before Christmas 2004, Kaneohe Ranch officials sent Phillips a letter asking if she wouldn't prefer the security of a one- or two-year lease, but it was Christmas time, "and I kind of forgot about it," she said. Her son Bill said, "that's where my mom, legally, has done a dumb thing and she knows that." Heritage Antiques in Kailua is about to close after 30 years in business. A customer, Jean Capello, browsed the store yesterday. Last month she got a letter indicating the store's lease would not be renewed. So Martha and Bill arranged a meeting with Steinwascher. They were told Kaneohe Ranch had received a commitment from another business that was champing at the bit to get into the space. However, they were also told Kaneohe Ranch would have someone work with them to find a new location. The new, yet unidentified tenant will be paying more than twice the $3,100 lease rent paid by Heritage Antiques, as well as a percentage of sales, Bill said. Heritage Antiques was given until March 20 to empty the shop, but Phillips paid through the end of the month and requested an extension to settle up with more than 100 customers who have items in the store on consignment; some are as far away as Europe, she said. No definite move-out date has been determined since attorneys for both sides are now involved. The alternate locations shown to the Phillips either were not suitable or not affordable, Bill said. His mother, 72, is unlikely to open in another location, but says the support she's received from the community has been heartwarming. "I know a lot of prayers have gone up," she said. She blames high property taxes for the lease rents being sought by Kaneohe Ranch, and she is concerned for the Kailua community. She said she has heard much opposition to the "upscaling" of the area. "I hear the heartbeat of the people. I know what's going on," she said. A local retailer has committed to take the space but there was no signed lease as of yesterday morning, Steinwascher said. He would not identify the retailer. Antivirus software guru John McAfee is planning another auction on Molokai. Not a parcel of more than 1,000 acres, as he did last year, but the private residence he's lived in on the East end of the island while building a home on the West end. It has more acreage and a hidden beach. The East-end home was on the market for about eight months, listed at $2.4 million, but it didn't sell, he told TheBuzz. He decided to go the absolute auction route again, hiring the Alabama-based National Auction Group Inc. for at least the third time. The company staged his huge Molokai land auction as well as the recent sale of McAfee's former waterfront home on South Padre Island, Texas. "I lost my shirt on that one, by the way," he said. It sold at auction for $2.2 million, when McAfee had invested about $4 million in it. The Molokai home and guest house being auctioned to the highest bidder is on 2.4 acres and was built in 1993. "I loved it. It's painful to part with, but I just can't live everywhere," he said. The three-bedroom main house has floor-to-ceiling windows through which "all you see is water," he said. National Auction President William Bone expressed concern that he's not seen more interest, with the April 6 auction just days away, but said, "He's going to sell it, no matter what (price) it brings. "We hope it will bring a good price, but it could be a bargain." Participants must ante-up with $50,000 and can either be present on the property or bid by phone on auction day. Property pictures and details are posted at www.nationalauctiongroup.com.